Hosting a major tournament on home soil is always a wonderful occasion that helps to unite a country, and with England recognised as one of the strongest teams on the international stage, there was overwhelming euphoria and support for the Three Lions. It was exactly thirty years since Bobby Moore lifted the Jules Rimet trophy aloft at Wembley in a truly iconic image that remains the pinnacle of sporting achievement in English football, but not only did Terry Venables have the squad to end a thirty year-long wait for success in a major international tournament, the whole country was right behind them. 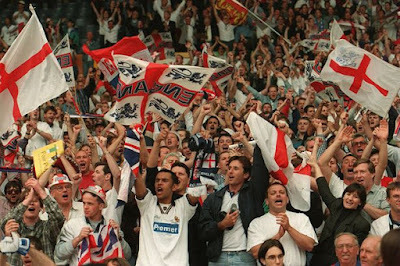 Euro 1996 provided a feel-good factor that has been sorely lacking ever since, and even though England ultimately failed in their quest to go all the way, it will always be remembered as a magical tournament that resembles the last time that fans could truly be proud of their team. Alan Shearer describes the England side in 1996 as the best he played in during his eight-year international career, with the undeniable level of quality throughout the squad matched by an unbreakable team spirit that carried them throughout the tournament. It was the level of commitment, passion and determination that made fans truly believe that the team was destined for glory, but there was also the quality to match. Not even a late Switzerland equaliser in the opening game was enough to dampen the spirits, with every player giving their all when they pull on the national team shirt – a far cry to the modern day era when players are arguably more concerned about playing for their domestic club and the considerably over-inflated wages they receive. Betway may have the Three Lions as comprehensive favourites to qualify for the 2018 World Cup in Russia in the latest sports betting odds, but there is a distinct lack is belief that the current crop of players have the quality to compete against the very best, or have the same level of fight and passion when wearing the England shirt that the likes of Shearer, Stuart Pearce and Tony Adams epitomised. The Switzerland game may not have produced the firework display that many were hoping for, but England responded in some style. A strong 2-0 win against Scotland will forever be remembered for Paul Gascoigne’s wonder goal that was followed by the ‘dentist’s chair’ celebration in reference to the heavy drinking sessions that England were criticised for leading up to Euro 1996. Then followed arguably the greatest performance from an England team at a major tournament aside from the 1966 win against West Germany – Venables’ team simply tore a fantastic Netherlands side, which contained the likes of Dennis Bergkamp, Jaap Stam (he replaced Frank De Boer who missed the tournament through injury), Clarence Seedorf and Ronald De Boer, to pieces with a comprehensive 4-1 victory. The Netherlands were seen as the masters of the beautiful game, but England outclassed them in every department and cut through one of the strongest defences in international football at will in a truly inspired performance that will live long in the memory. type of player that Pearce was, but also defined the never-say-die attitude that established a strong bond between the team and the fans who remained united throughout the tournament. Matches between England and Germany will always carry historical relevance and a rivalry that goes beyond football, but the former had the opportunity to avenge the painful defeat at the same stage of a major tournament six years earlier. Listening to the national anthem being sung that day continues to give people goosebumps, and while many use it as an example between the complete contrast in passion and what it means to represent your country between then and the present day, it set the stage for a wonderful semi-final at a packed Wembley stadium. Paul Young was overpowered by the sheer volume of singing from England fans and the players who belted out God Save the Queen with a level of patriotism and pride that showed just how much representing their country meant to them. It was arguably no surprise that the mass euphoria and buzz around the stadium led to Shearer scoring as early as the third minute, but an equaliser from Germany shortly after led to a superb battle between two teams who were at the peak of their powers. England certainly dominated in terms of chances, with Teddy Sheringham seeing a shot cleared off the line and Darren Anderton hitting the post in extra-time, although the latter is not the chance that has remained etched in the mind of England fans old enough to remember. Gascoigne’s desperate lunge in an attempt to reach Shearer’s low cross across the penalty area will have been replayed a million times by those involved on the pitch and those who witnessed it – England were a matter of millimetres away from the final, but such small margins can prove to be decisive. The 1950s: Football's Finest Decade?